Melbourne protest against Work Choices, September 2007. November 16, 2013 -- Green Left Weekly -- Over the years, I have heard many left-wing activists say that mass peaceful protests do not achieve anything. Rather, “militant actions” which “take it up to the ruling class” are more important. But for smaller direct actions to have any real political significance, they have to be connected to a patient and democratic approach to building mass movements that can win reforms. Smaller direct actions that are not tied to this political aim are a posture. In a period of relative political quiet, some on the left are being snookered into the false idea that demonstrations that insist on direct action and militancy are the only way to win reforms. This is a failed strategy, because it rests on the notion that a tiny number of conscientious and outraged activists can frighten or shock the ruling class into delivering reforms or stopping cuts. This sort of idealism is dangerous, and ignores evidence of how social movements throughout history have grown and succeeded in their aims. When I first arrived in Melbourne in 1993, I met a man at a tram stop who told me that Victorians supported then-premier Jeff Kennett because they had stopped protesting. February 22, 2013 -- Green Left TV -- The Green Left Report hosts a roundtable discussion and debate on the millions-strong protests prior to the US war on Iraq, held around the world on February 15, 2003. The roundtable includes some key activists at the time who reflect on the strengths and weaknesses of the protests in Australia and lessons for progressive struggles today. Pip Hinman was a leader of the anti-war movement in Sydney at the time; Nick Deane convened a local peace group; and Jim McIlroy, who has been an anti-war activist since the Vietnam war, was part of the Brisbane protests. Also featured is an interview with Simon Butler, who led Books Not Bombs protests of high school and other young people opposed to the war. Hosts are Mel Barnes and Peter Boyle. Footage of the 2003 anti-war marches in Sydney by John Reynolds and Jill Hickson of Actively Radical﻿ TV. The episode ends with Carlo Sands critiquing the notion of the "lesser evil". 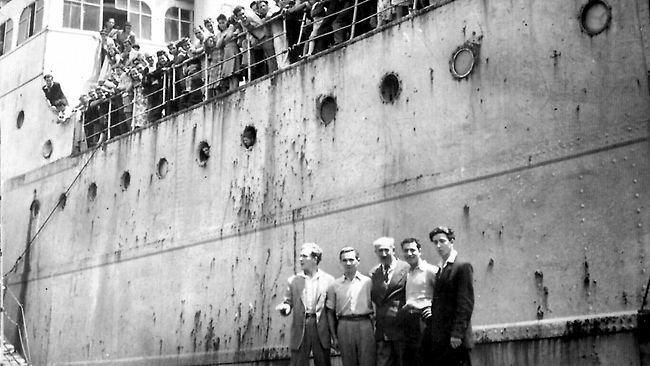 European migrants to Australia aboard the ship SS Derna on their arrival in Melbourne in November 1948. February 22, 2013 -- Links International Journal of Socialist Renewal -- Below are two chapters from Australian socialist Douglas Jordon's thesis on the Communist Party of Australia. They deal with the CPA's sometimes inconsistent attitude to migration and racism within the Australian working class. As such issues continue to feature heavily in Australian politics and trade union activity, something the left must always deal with, these chapters provide useful lessons and experiences for socialists today. The chapters are availabe for download as PDF files or can be read on screen below the introduction. Douglas Jordan was politicised in England in the late 1960s. After arriving in Australia he joined the Socialist Youth Alliance/Socialist Workers League/Socialist Workers Party, in which where he remained a member for 14 years. Today he is a community activist and co-presenter of the City Limits radio program on Melbourne's 3CR. January 2013 -- Links International Journal of Socialist Renewal; this is a preprint of an article submitted for consideration in Capitalism, Nature, Socialism, copyright 2013 Taylor and Francis; Capitalism, Nature, Socialism is available at http://www.tandfonline.com/toc/rcns20/current. This article* examines the extent to which Green parties can be considered social-democratic formations. The Australian Greens, since 2010 in de facto governmental coalition with the Labor Party, are posited as an important case study of the global Green party movement. The Australian Greens have generally been seen as a far-left party, as expressing the views of the new social movements or as a site of tension between these two tendencies. Protesters heckle climate denier Barnaby Joyce, a senator with the right-wing opposition National Party, as he speaks in Wollongong's Crown St Mall. Photo by Paola Harvey. July 15, 2011 -- "Our Common Cause", Socialist Alliance's weekly column in Green Left Weekly -- Action on climate change is one of the most important issues of all. But the Australian Labor Party federal government’s carbon price plan is not a serious response. It is not grounded in climate science. The biggest problem is that it aims to take 10 years to cut Australia’s emissions by just 5% (based on 2000 levels). This is nowhere near enough. It’s so far from enough that even if it succeeds, the world will still be pushed into an unstable, dangerous climate system. Most other developed countries have pledged much bigger emissions cuts than Australia. Yet most climate scientists say all the promised cuts put together will be too little, too late. July 8, 2011 -- Antipodean Athiest, posted at Links International Journal of Socialist Renewal with permission -- In the lead-up to the March 2003 US invasion of Iraq, the pop group the Dixie Chicks played a concert at the Shepherd’s Bush Empire theatre in London. One of the group’s members, Natalie Maines, a native of Texas, made a critical comment about a fellow Texan, George W. Bush who was then president of the United States. She said that “Just so you know, we’re on the good side with y’all. We do not want this war, this violence, and we’re ashamed that the president of the United States is from Texas.” A seemingly innocuous comment, you would think? Sam Watson, Socialist Alliance Senate candidate for Queensland. Longstanding leader of the Aboriginal community of Brisbane, campaigner against Black deaths in custody and for Indigenous rights. 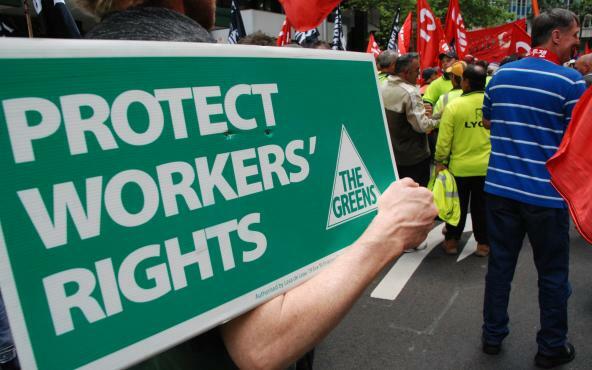 On July 24, 2010, Australia's leading socialist newspaper Green Left Weekly spoke to Peter Boyle, national convener of the Socialist Alliance, about the political climate of the 2010 federal election, to be held on August 21. Many progressive people are feeling depressed about the federal election. How do you see it? The Australian Labor Party and the conservative Liberal Party-National Party Coalition are in a “race to the bottom”, as Socialist Alliance lead Queensland Senate candidate and Murri [Indigenous] community leader Sam Watson aptly put it.